You have added Amber Glow Embellished Dress in Navy into shopping cart. You'll positively glow in this gorgeous flowy dress with delicate embellishments at the bust, neckline, and shoulder straps. The Amber Glow Embellished Dress is fully lined and is made of a flowy chiffon fabric. It has a square neckline, spaghetti straps, an empire waist, and a flowy cut. The best part of this dress has to be the silver and bronze gold bead and sequin embellishments that decorate the bust and shoulder straps. We love how the beading is delicate and just adds the perfect extra touch to this look! The skirt is fully lined and mesh fabric trims the lining to add volume to the skirt. A hidden side zipper completes this dress. The Amber Glow Embellished Dress would look nice paired with strappy heels, wedges, or pumps. It could also be dressed down in the summer with flat beaded sandals or gladiator sandals. We also think it looks perfect paired with a fitted flowy cardigan in the Fall and Winter. So many ways to wear this adorable dress! Details: Fully lined. Hidden side zipper. 100% polyester. Lining: 100% polyester. Dry clean only. Small measurements: Length from top of shoulder to hemline: 34". Bust: 33". You have added Amber Glow Embellished Dress in Navy into Wishlist. You have added Amber Glow Embellished Dress in Navy for Stock Notification. 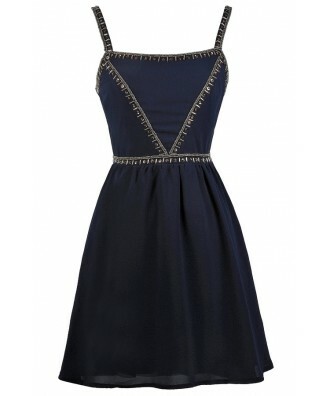 You have set Amber Glow Embellished Dress in Navy as a loved product. 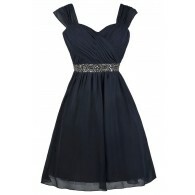 You have removed Amber Glow Embellished Dress in Navy as a loved product.